Auckland, New Zealand (AP) — The British and Irish Lions conceded a late try and lost 22-16 Wednesday to the Auckland-based Blues in their first-ever match against a New Zealand Super Rugby team. After an unconvincing tour-opening win over the Provincial Barbarians, the Lions were beaten three tries to one by the Blues, who are in last place in the New Zealand Super Rugby conference. Replacement flyhalf Ihaia West scored and converted his own try after bursting at pace onto an offload from Sonny Bill Williams in the 73rd minute to overturn a fleeting 16-15 lead held by the Lions, delivering an early defeat to Warren Gatland’s touring squad and a significant setback ahead of the three-test series against the All Blacks. The Lions’ tour becomes immeasurably more difficult from Saturday when they face the Christchurch-based Crusaders who are unbeaten in 14 matches. The match pivoted in favor of the Blues when All Blacks star Williams scored a try in a goalline scramble on the tick of halftime, sending the Blues to the break with a 12-10 advantage. The Lions reclaimed the lead with two penalties to Wales fullback Leigh Halfpenny — their only second-half points — before Williams combined with West for the match winner. The tourists hoped that the match had been saved when Halfpenny’s third penalty put them ahead 16-15 with 10 minutes remaining. But the Blues backed their attacking rugby style and Williams handed off a pass to West, who weaved through the defense at speed and touched down near the posts. The Lions now face the realization that the easiest part of their tour is behind them and they have failed to lay down any marker for the future. They were unconvincing and lucky to escape with a 13-7 win in the opening match; their second performance was better but they were still not good enough to test a Super Rugby team. “We’re hugely disappointed,” captain Ken Owens said. “We came here to build on Saturday’s performance. “We were coming here to get another victory but unfortunately we got a defeat. All credit to the Blues, they took their chances. Owens pointed to the Lions’ set piece as a positive but said inability to retain possession let them down. 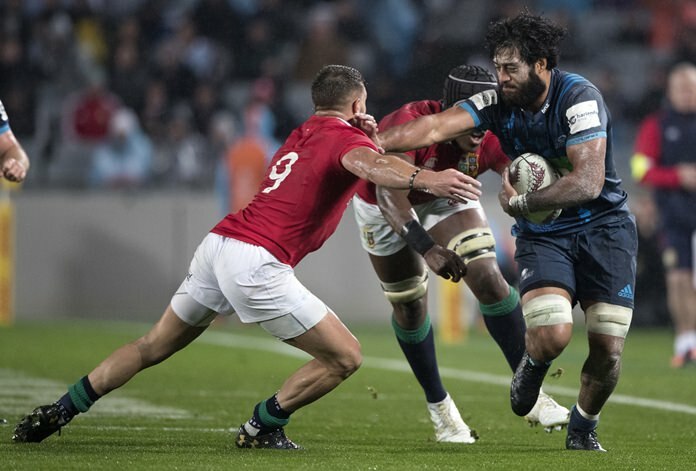 While the Lions had a footing in the match through their scrum, they made few attempts to play attacking rugby and were vulnerable to the counter-attacking style of the Blues. Unless they can rapidly improve, especially in their ability to create try-scoring chances, the Lions face the prospect of more losses on a long tour. They struggled again in a game played at pace and were unable to dictate the pace of the game through their control of possession. They were forced under pressure to kick the ball into the Blues’ hands and that furnished opportunities to the home team. Williams likely sealed his test place with his performance. He returned to the Blues lineup for this match after a lengthy break with a knee injury and was unaffected by his fast during Ramadan. The Blues took the lead after seven minutes with a try to the All Blacks winger Reiko Ioane, created by a superb long pass from rookie flyhalf Stephen Perofeta. Perofeta was handed his first start for the Blues but apart from the pass to Ioane, he struggled to control the match. The Blues were more settled when West took over in the second half. The Lions seized the lead with a try to South Africa-born flanker C.J. Stander from a lineout drive and extended that lead with Halfpenny’s first penalty. But Williams’ try on halftime swung the match.